Carmelo Anthony recently took to his Instagram account and shared some of his sneakers. 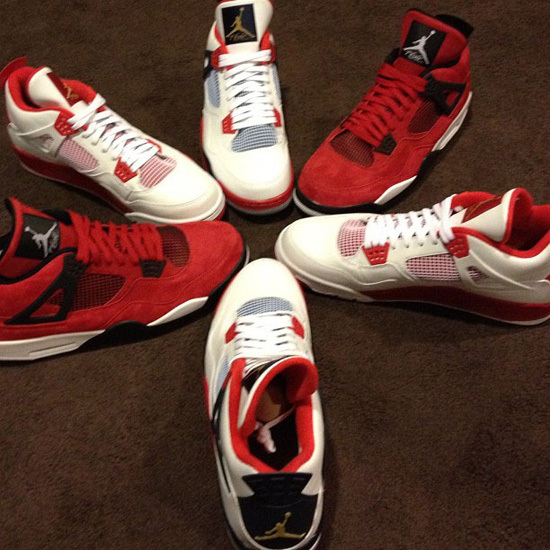 In that picture were three player exclusive colorways of the Air Jordan 4 Retro. The first pair I will point out is the original "Fire Red" edition that was recently re-retroed. Replacing the black is a midnight navy and, gold accents are found on the back heel as well as on the tongue tag. Very USA-inspired. Next, a clean white and red pair. Lastly and my favorite of the trio, a red-based pair featuring a suede upper with black and white accents. While i'm sure we'd all be happy if any one of these released I for one would love to add a couple pairs of those red suede's to my collection both to rock and to stock. Enjoy the full image below.